Last summer you might have read about the results of an international report released by the Organization for Economic Cooperation and Development (OECD). According to the study, “the U.S. ranks below average when it comes to innovation in primary and secondary schools, while countries such as Denmark, Indonesia and South Korea top the charts.” [“Report Finds U.S. Schools Rank Below Average in Innovation,” by Caroline Porter (@carolineporter), The Wall Street Journal, 17 July 2014] About the same time that the OECD study (entitled “Measuring Innovation in Education: A New Perspective“) was released, Cornell University, INSEAD, and the World Intellectual Property Organization (WIPO) released the “The Global Innovation Index 2014.” Reporting on the Index, Pam Tobey (@tobeypam) wrote, “Switzerland is a four-time champ when it comes to global innovation. The United States? 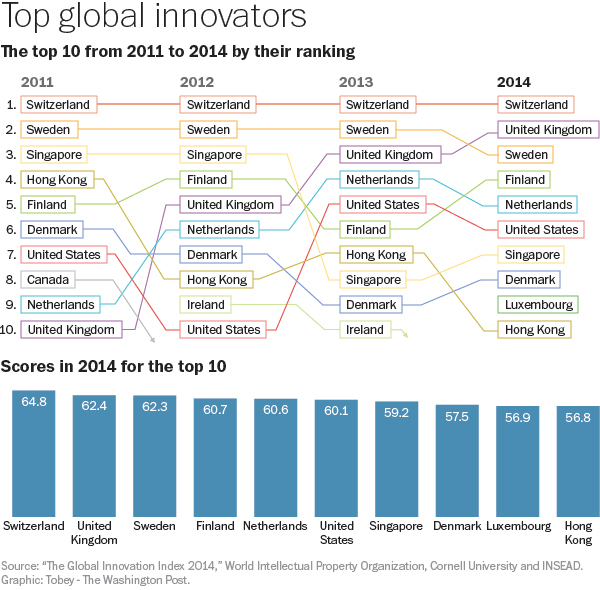 Not so much lately — the country last achieved that spot in 2009.” [“Report: The United States not even close to being top global innovator,” The Washington Post, 23 July 2014] Included in Tobey’s article was the following graphic that shows which countries are ranked in the top ten for innovation and how their positions have changed over the last few years. I suspect part of the answer to the first question involves the fact that the U.S. has gone through some troubling economic times over past couple of decades (but so have other countries). Confidence in the future has been eroded by terrorist acts, stagnant wages, a collapsed housing market, financial chaos, and political deadlock. America must again find the confidence to take on risks that are inevitably associated with innovation. Fostering a culture of innovation is something we should do from the cradle to the grave. It appears that a good place to start fostering a culture of innovation is in education. Remarking on the OECD study, which involved innovation in education, Stéphan Vincent-Lancrin, co-author of the report and a senior analyst in the education department of the OECD, stated, “In many other areas of the economy, we take innovation very seriously. This is something we should monitor in education.” I agree with that position. That’s why I, along with a few colleagues, founded The Project for STEM Competitiveness — to find innovative ways of teaching science, technology, engineering, and math-related subjects in our schools. According to Porter, “The report, a first for the Organization for Economic Cooperation and Development, outlines new practices in classrooms and schools — both public and private — as well as teachers’ methods and tools. It then tracks countries’ efforts to improve education through these methods with international data sets already in existence. Researchers found that innovation led to improved math scores for eighth-graders, a narrowing of the achievement gap and happier teachers.” Not only do innovative methods of teaching improve test scores, they inevitably instill in students a sense of creativity and excitement that will serve them a lifetime. According to the OECD report, there is a lot more emphasis being placed on educational innovation in higher education than in primary and secondary settings. I believe we need to start fostering innovation much earlier. The approach we have taken with The Project for STEM Competitiveness is a hands-on, project-based approach. By tackling real problems, students get to see real results from what they are learning. How often have we heard a child ask, “When I am ever going to use this?” In a project-based approach, the answer is obvious. George Bradt (@georgebradt), a Principal of CEO Connection and Chairman of PrimeGenesis, writes, “Innovation that sticks is purposed-driven — led by someone on a mission to do good for others.” [“Why Purpose-Driven Innovation Trumps All,” Huffington Post The Blog, 12 November 2014] Purposed-driven innovation is a sub-category of problem-driven innovation, which many innovation experts insist is the best way to foster lasting innovation processes. There is a reason that the old adage “necessity is the mother of invention” came into being. Problems force us to think because they represent obstacles to our progress. I believe that children who learn to be creative at a very young age will carry that skill with them into the working world. He goes on to describe how a series of “Santa Fe Conferences” held in the 1990s tackled big, philosophical questions like: “What are the defining properties of life? Can the defining properties of life be understood in an abstract way, independent of the details of biological life as it appears here on Earth? Can we re-create the defining properties of life in other things, like computer programs or robotic machines?” He then discusses how participants in those conferences “have since dispersed” but “the work that they did on the ‘big philosophical questions’ has produced many fruits in the technology world.” I believe the “big idea” approach has some merits. I want people asking questions about global problems and human conditions and trying to figure out how they can help solve them. I want young students exposed to big ideas so that they understand they will be entering a world that needs their help. In the end, a good innovation solves a problem for a group of people. The larger the group it helps the more successful the innovation. You can draw a straight line from Steven’s philosophical approach to Bradt’s purpose-driven approach — and that line runs directly through problem solving. If we want America to regain its position at the top of the world’s innovation leaders, then we need to start fostering a culture of innovation in our children — the earlier the better. That cradle to grave approach will serve well both the individual and nation.